Posted on January 23, 2017 at 11:17 am. The Tasmanian Liquor and Gaming Commission has released a paper discussing several options for the proposed pokies reform that could shape future gambling laws. The discussion paper and subsequent public feedback will be used to determine the community interest test that will be applied to applications for future gaming machine operators. 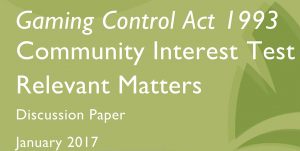 Tasmanian government introduced the Gaming Control Amendment (Community Interest) Act in late 2016 in order to give the community a say before any new electronic gaming venue is granted a license. Under the proposed community interest test, all applicants will be required to place a notice in the local newspaper advising of their application to operate electronic poker machines, along with notification that it’s subject to a community interest submission. Members of the public will have 14 days from publication of the notice to write to the Liquor and Gaming Commission voicing their objection in regards to community interest matters. The commission’s discussion paper suggested that if a proposed poker machine operator fell within close proximity of a pawnbroker or payday lender, it could mean a refusal of licensing. Other entities within two kilometres of a gaming venue that could be considered as part of the community interest test include schools, places of worship, shopping centres, sports and community facilities, childcare centres, hospitals, welfare services, aged care facilities and problem gambling support services. Other factors that could be taken into consideration under the community interest test include the age and gender distribution of an area where a gaming license is requested. For example, the 18-24 age group has been identified as being at particularly high risk of developing gambling problems, so age distribution could be a key factor when determining an electronic gaming license for a particular area. Education levels, average income, socio-economic indexes, population and projected growth, unemployment levels, ethnicity, occupations and housing costs are all suitable factors to be taken into consideration when determine a venues application for a new gaming license. Pokies Reform coalition spokeswoman Meg Webb said she would like to see local businesses included in the community interest test as poker machines take money away from all local businesses. The requirements of the community interests test are expected to be finalised by June 2017.